Every day Sandrine puts to use advice given by the activist African American author, Maya Angelou: "Life is better when you are laughing", and thus she never looses her radiant smile. Shorts and Leggings: Nike, Sweat: Fila. Jump Rope: colettegym and Lolë. All Images by Corinne Stoll. Since she is in charge of social media for the concept store colette, she is into everything, fan of Jump Man and Cassius Clay, puts time aside for sports and especially for cardio activities. 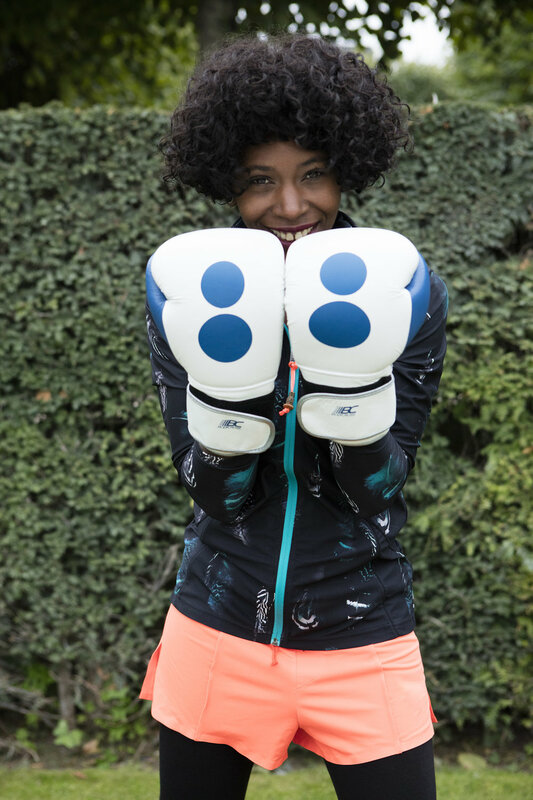 She applies herself as much as in arabesque gallop, as in throwing the javelin, and mastering choreographies by Ginger Rogers as well as those of Michael Jackson, Sandrine today goes from a boxing class to a cycling class. Interview with a woman overflowing with energy. Inside/Out: What is the first sport you practiced? Sandrine: Swimming, over several years. When I was younger I rode horses especially vaulting. To be standing on horse is amazing. Tap dancers: I admired Bill Robinson, Fred Astaire and Ginger Rogers. Athletics, especially the sprint and javelin. The last several years: running, boxing and today Dynamo cycling. I do a lot of cardio and I would like to take up something softer like yoga or meditation. S: My first victory in crawl! S: Dancing via Michael Jackson, my idol. I started with classical dance, modern jazz and hip-hop. It is a discipline I should have continued because I so appreciate it. Sweat: NIKELAB x SACAI. Bombers: Fears of God. S: Michael Jordan for his slam dunks or Mohamed Ali, Cassius Clay I am the greatest. His story, his experience, his victory, his convictions, his commitments. He remains in my eyes one of the greatest athletes in the world. I/O: An important memory to do with exercise over the last few years? S: Simone Biles, la puce, 1m45 she is incredible, I adore her! Nothing predestined her for gymnastics yet she won three years in a row the general competition. She is the first African American to win the title. And to top it all off, she has ten world champion titles. S: It is a mix and also a lego, you have to put together everything, coordinate, connect. After all we try! I am completely fulfilled by my work, it allows me to mix my private and personal life, and it is unarguably an advantage. S: A Maya Angelou quote: "Life is better when you are laughing". S: It has really changed. If beforehand exercise was synonymous to torture, today, we definitely all dream of having a perfect body, but exercise before anything represents well being. To feel well mentally, in our bodies, have a moment for ourselves. Exercise is now an integral part of Parisian life. She will go run 10KM, do pilates, yoga, followed by brunch or a drink with her friends. It is no longer an inconvenience but enjoyable! We will even get up at the break of dawn for a class. We are bombarded with new sports centers opening, new forms of coaching, by juice bars, healthy addresses, there is a selection for all tastes and pocket books. Life is better when you’re laughing. Sweat: NIKELAB x SACAI. Rings: Chrome Hearts. S: Fashion sportswear has not stopped evolving in terms of: technology, design, collaborations, it is everywhere in the street, in magazines. Brands have made a comeback such as: Champion, Fila, Sergio, Tacchini, or the return of soft skin like J.Lo is a good example. S: Sports are a pleasure. You exercise and then: fondue! S: The legging, practical and comfortable. I/O: Your favorite sport or athleisure brand? S: The Nikelab in Paris. S: Lemon water in the morning (for its detox and draining affect). I/O: Dressed all in black from head to toe or you allow yourself color? S: In black, but I allow myself touches of color. S: As a smoker, I try to put out my last cigarette at a minimum an hour before a class and to wait at least an hour after to smoke another. And to drink a lot of water, hydrating is essential. Sweat: Under Armour. 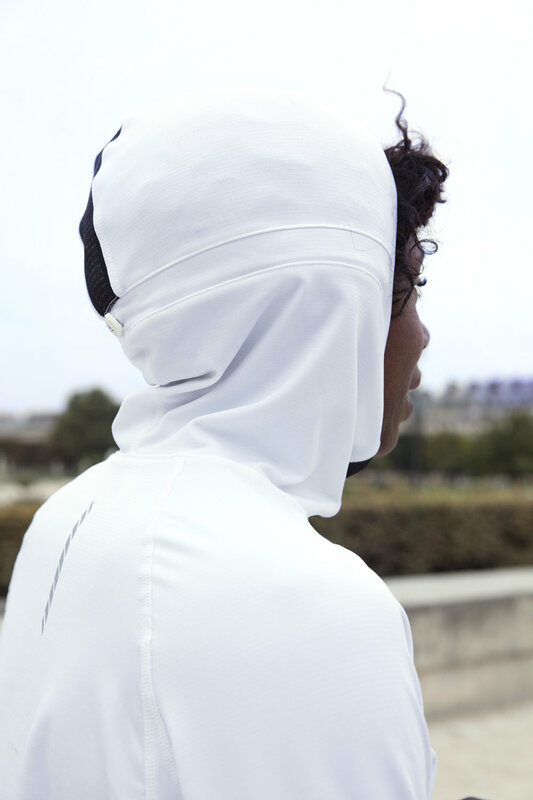 Legging et Running: Nike. I/O: Have you traveled before to exercise? S: I traveled to Milan, Berlin and Amsterdam for the basketball tournament “PXA”(Pigalle, Xberg, Amsterdam) that grouped together all the teams from Pigalle, BKRW, Wood Wood, Soto, colette, Slamjam etc. But the trip was more of a community driven initiative than performance, it was above all else fun. Only great memories. And thanks to this tournaments I have met amazing people who became friends. I/O: Does music play a central role in your choice of exercise? S: Yes and no. I will not choose an exercise for the music selection, at Dynamo it is motivating. However if I run by myself, music becomes crucial. Jacket: Protest. Gloves: colette. Leggings: Nike. I/O: Are you sensitive to the idea of a new feminism? Do you feel that women support themselves more today and are excelling together? S: A new feminism no, but a new consciousness maybe, we are all feminists in spirit, and as women we need to stand together and support one another. From time to time I will be in spin class next to someone I do not know and we will motivate one another. It happens as well to get thanked by a woman who felt motivated being behind you the entire class, this is enjoyable. Sports help eliminate certain walls, we are not all there to observe, criticize, on the contrary to encourage one another, excel, to motivate and mutually congratulate one another. S: Yes for me: my Dynamo crew. 1 suggestion to acquire the best benefits from exercise: listen to your body. 1 restaurant address: le Tricyle, 51, rue de Paradis, 75010. 1 inspiration: Africa is my country, Paris my city. 1 person we should interview : Candace Parker for her memorable slam dunk (From 2005-2006, for her beginnings with Lady Vols, She became on March 19 2006, the first woman to dunk during a final NCAA tournament. During the same match she had a second dunk).